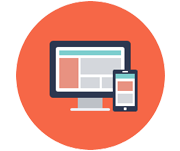 Responsive website design (RWD) is one of the web development technique that creates dynamic changes to the look and feel of a website, depending on the various screen width and orientation of the device being used to viewing it. User Responsive website design is a the latest version design approach for the websites to give an finest viewing experience – easy reading and navigate with a least amount of resizing, and scrolling – across a wide range of normal computer and hand-held devices. Around the world, 91% of citizens having their mobile devices within reach 24/7. And keep on checking their mobile phones an average of 150 times in a day! Coming days Mobile web browsing is projected to take over normal desktop Internet usage by 2016 or nearer. Globally 90% of individuals make use of multiple screens to access the internet. 92% of smartphone searches results in a buy or a visit to a industry. Point to consider – the financial implications of non-responsive web design may be computable, the business chance loss cannot. Time to jump into some of our responsive work. How we do Responsive Design? The same HTML Script is served to all devices, using CSS3 (which determines the layout of website) to adjust the look and feel of the page. Rather than creating a new website and corresponding codebase for big-screen monitors, desktop system, laptops, tablet pc’s and smartphones of all sizes, a single codebase can support consumer with differently sized viewports. Verus Solutions is dedicated to provide businesses with web development and innovative business solutions tools for developing and maintaining business solution software. Verus Solutions mission is to provide our clients with various internet products which help for their business that ease the creation of a significant competitive advantage. We give you Fresh Ideas that works!! "I have been very pleased with the work finished! The functionality has been accurately as designed, and the design was further than we had initially envisioned proficiently expressive my company. The grouping of cost, timely web site creation, and on the whole result made us very satisfied to work with Verus Solutions. " "Thanks for your team patience in listening and developing all my needs. The website is working well. At this moment, I would like to praise you, your team for the tremendous job done. " © Copyright 2015 - 2019 Verus Solutions.